Whatever the occasion, Alpine Travel offers a high quality chauffeur driven service with luxury vehicles to individuals, groups, organisations and businesses. 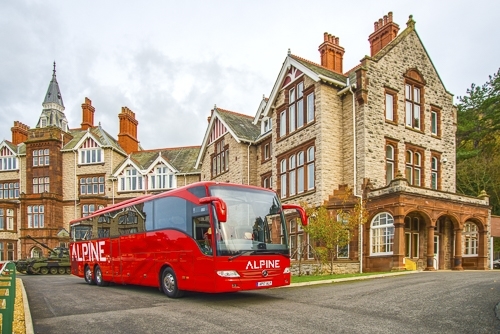 Alpine Travel operates one of the largest and most modern fleet of luxury motor coaches in North Wales. Our varied fleet of coaches comprises of midi, standard, luxury to executive specification coaches with seating capacities ranging from 25 to 70 seats. All of our coaches large and small are maintained to an exceptionally high standard with safety and reliability being of the utmost importance. To this end all of our vehicles undergo a first use safety check every single day and a rigorous safety maintenance inspection (similar to an MOT) every 42 days to ensure that our vehicles are always operated in a safe and efficient manner. In an endeavour to ensure that our business activities create the least possible impact on the environment all of our vehicles are equipped with GreenRoad Telematics. This state of the art technology provides the driver with continual feedback and ensures that our fleet of coaches are driven in a careful and considerate manner, which improves passenger experience, reduces fuel consumption and our carbon footprint. Also 60% of our modern fleet of coaches are rated Euro V or better which is currently the highest European Environmentally friendly standard.